This is a great book for anyone who provides childcare to children aged 8 or under. It teaches how to help children develop skills in many ways. I used this book for one of my early elementary education courses, and it worked like a charm. Well-written and well-organized. 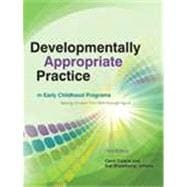 Developmentally Appropriate Practice in Early Childhood Programs Serving Children from Birth through Age 8: 5 out of 5 stars based on 1 user reviews.